Jesus is everywhere at one time. My little niece (not by blood, but by blessing) Madelyn reminded me about Jesus, and his penchant for being everywhere one day after church. I was making her a peanut butter sandwich for her lunch. She was sitting at the kitchen table, swinging her feet high above the floor, and humming. “What did you learn in Children’s church today?” I asked her . I laughed out loud. At nearly three years old, Madelyn has a host of imaginary friends, so I was not surprised that she concocted a scenario in which Jesus lived in my bathtub. It wasn’t until I took her to the potty in that same bathroom later that day that I saw Jesus in the bathtub, too. There, on a shelf behind the garden tub, is my favorite sculpture. 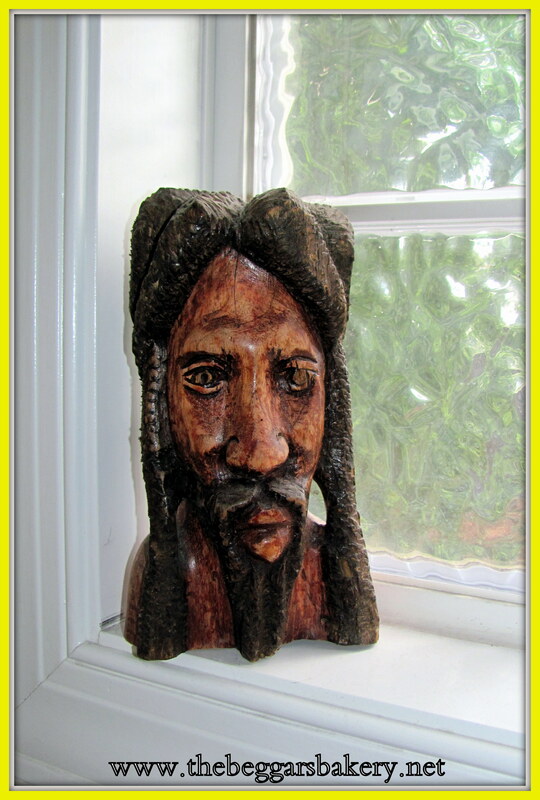 It is a bearded man carved from wood with long locks of intricately whittled hair. At about a foot tall, it is hard to miss. I’m not sure of its origins but I suspect my husband acquired it on a trip to the Caribbean years ago. The expression of the wooden man is peaced-out, contemplative and focused all at once. I always kind of thought he was Bob Marley…..but okay. Jesus works, too. “It’s Jesus,” Madelyn repeated, as if reading my thoughts. Later that day, this exceptional little girl informed me that Jesus also lives in her heart. Kids are so literal, believing that when Jesus is “in your heart”; he is in your heart. And they are so faithful to know beyond a shadow of a doubt that even though He lives in my bathtub, He is still everywhere all at once. Not like an imaginary friend, who can only be in one place. But everywhere, peaced-out, contemplative and focused on us. I love how literal children can be about their faith. When my daughter was young she knew that God lived inside her, and after a meal she would lift her shirt, speak into her belly button and ask God if he enjoyed supper. That innocence and simple knowing that God is there to speak to is such a reminder that having a relationship with God should not be complicated. It simply is–if we let it be. Ena, that is adorable AND profound! We humans do complicate things as we grow up. SIMPLIFY, right? Have a wonderful weekend!